Critical hits are special types of hits dealt to monsters (and other players in PVP). 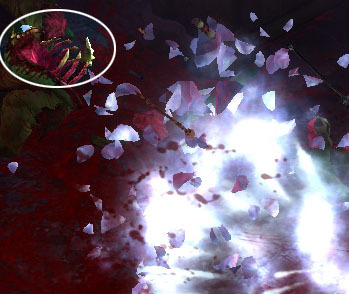 Monsters that die from critical hits usually explode in an especially gruesome death animation, adding visual fun to the killing bonuses, or are otherwise blasted with the full force of the physics system, sending them caroming overhead and out of the camera's view. Crits are very important in Diablo 3, and using skills and especially items to raise a character's critical hit chance (CC) and critical hit damage (CD) is the best way to increase character damage and performance. Landing crits is also essential to trigger procs in many skills. Most of the best builds in Diablo 3 require a fairly high critical hit chance in order to keep the procs functioning to restore resource, reduce cooldowns, heal, and more. Characters have a base 5% crit chance and a base 50% crit damage,  and players aim to increase both figures considerably with equipment and skills. There is no hard and fast rule about how much is enough (it varies by class and build) but (as of v1.06) well-equipped characters generally have 30-50% CC and 300-500% CD, with larger values to both possible with high quality gear. Crits displayed in yellow text. There are a few crit-related gameplay terms that are used as variables on items, skills and other gameplay effects. It's important to know the difference between them: See the CC and CD articles for much more detail on those functions. Critical Hit / Crit - The actual event when a critical hit lands. Increased damage and an added effect, depending on the school of damage used. Critical Hit Chance / Crit Chance - Chance of landing a critical strike. Critical Hit Damage / Crit Damage - The actual damage dealt when a Critical Hit has landed. Physical Damage: Deals double damage and possibly knockback. Cold Damage: Critical hits from cold damage freeze targets for 2 seconds. Fire Damage: Critical hits from fire damage set targets ablaze, dealing additional damage per second. Lightning Damage: Critical hits from lightning damage stun targets for 2 seconds. Toxic Damage: Critical hits from toxic (poison) damage had an unknown bonus. Extra damage over time? These functions were removed along with the entire system of elemental damage from characters, and all critical hits became hits that added (at base) 50% damage. 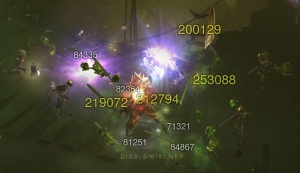 There are no special secondary effects (other than visual) to critical hits in Diablo III, though many skills trigger procs when crits are scored. CHD raised through a weapon and gem. Critical Hit Chance (CHC) and Critical Hit Damage (CHD) can be raised in a number of ways. First and foremost is from items. Many items will grant the player an increased chance to crit. These incremental increases are percentage-based, but also a flat value. So if a player has 5% chance to crit, and they get an amulet that offers an additional 5% chance to crit, their overall chance to crit will be 10%. CHC is, then, addititive and not multiplicative. An Emerald socketed in any weapon. Certain Legendary items in other item slots. Certain Legendary items in odd slots. Many skills and passive abilities also add relevant bonuses, such as (for CHC) the Barbarian passive Weapons Master will increase CHC by 10% when wielding an axe. Similarly, the Demon Hunter passive Archery adds 50% CHD when wielding a crossbow, but adds 10% CHC when wielding a hand crossbow. These and other such passives are among the most popular in the game. On average, the extra base damage (i.e., excluding skills and stats) from critical hits works out to (CHD% * CHC%). Thus, the optimal strategy for increasing total CHD is to increase whichever stat gives the larger gain, percentage-wise, over its previous value. For example, consider a player with a 25% chance to crit for 60% extra damage, who must choose whether to add 10% to CHD or 5% to CHC. The following is information archived from when Diablo III was in development. The information is not current, but it is retained for historical value. It is worth noting that shattering of a frozen monster still occurs in the game, apropos to what happened in D2. Critical hit reduces a monster to a puddle. Exactly how critical hits work and how much damage they deal isn't yet entirely understood. This is partially due to the fact that the game remains under development and that the features are in flux, but it's also due to critical hits doing a lot of different things in Diablo 3. In previous games in the series critical hits were simple; they doubled physical damage. In D3, the biggest change is that critical hits work on all types of damage. Not just physical, or melee, but various types of spell damage as well, and apparently they can trigger from elemental damage on weapons as well. The basic critical hit bonus is still +100% damage, but various skills increase the damage of critical hits, while others increase the odds of critical hits scoring, or cause other effects to trigger when a critical hit is scored. How these will all interact remains to be seen. Monsters that die to a critical hit get a special "critical death" animation, which is extra gory. A few examples can be seen in screenshots on this page. The monsters literally explode, leaving chunks of themselves scattered across the ground. These animations are customized for whatever type of damage killed them; the chunks have flames licking across them from fire damage, sparks and arcs from lightning, etc. Physical damage critical deaths tend to leave huge slicks of blood, and give a battlefield a lovely post-massacre patina. These were demonstrated during a panel at BlizzCon 2008, an excerpt from which can be seen here. This is a partial list, since the game is still under development and skill descriptions and functions are bound to evolve over time. Looking at what sorts of skills add or otherwise interact with critical hits can be illustrative, though. Cold critical hit, with highlighted gore.. The Barbarian has a number of skills that increase the % damage of his critical hit, and a few interesting skills that boost other properties (such as fury generation rate and defense) when he scores critical hits. There aren't any known skills (yet) that increase his chances to score critical hits, though. Inspiration "increases critical hit damage by 3% and increases the damage of added hits by 5% for 15 seconds." It's not known what this description means by "added hits." The bonus to critical hit damage seems very small too. Just 3%? Would that make the total bonus +103% damage? Or do Barbarians have some value other than +100% for critical hit? Battle Rage is a buff that temporarily (15 seconds) increases damage by 100% and critical hit damage by 30%. Hammer of the Ancients boosts critical hit damage when using this active skill. Critical Attacks this passive skill boosts critical hit damage by 20%. This skill apparently boosts all critical hit damage for the Barbarian, even that inflicted by non-special attacks, and skills from other skill trees. Deliberate Defense. "On a critical hit, +10% armor for 15 seconds." This skill is a sign of how integral Blizzard wants to make critical hits to the game. This one boosts the defense when a critical hit is scored. It would seem to directly incentivize standing toe to toe with enemies and smacking them in the face; the more critical hits you score, the less likely they are to hit you back. Savage: This passive skill "Increases Fury generation 30% for 8 seconds after scoring a critical hit." No critical hit bonuses from Witch Doctor skills are yet known. This isn't a sign that there aren't any, though. It's just due to the WD only having 11 skills on display at BlizzCon 2008, while the Wizard and Barbarian had more than 50 each. Most Wizard skills seen at BlizzCon 2008 displayed the bonus provided by a critical hit of that type of damage (cold, lightning, etc), but there were fewer skills that actually boosted or affected the frequency of his critical hits. No skills in this tree listed bonuses related to critical hits as of October 2008. Thunderstruck: Increases the critical hit chance of all lightning spells by X%. The bonuses listed on this passive skill as of BlizzCon (October 2008) started at 5% and increased 5% per skill rank. It's not known what the base bonus to critical hit is, for the Wizard. This skill might increase it from 0%, or Wizards might have an inherent bonus based on their Clvl, or attributes, or there might be bonuses to be had from equipment. Deep Freeze: Increases the critical hit chance of all cold spells. This passive spell adds 5% chance at Rank 1, and more at higher ranks. Lethal Energy: Increases the chance to score critical hits with melee and spell attacks. Grants a 5% bonus at rank 1. This seems like a very powerful skill, if it indeed works for all spells, including those in other trees. It's a fairly high level skill though, and would require a substantial investment into the Storm skill tree to enable it, but it might still be worth it. Nothing is yet known about this. It seems likely that bonuses to the damage and/or likelihood of critical hits will be found on equipment, but how common or rare such bonuses will be remains totally unknown. It's certainly something the D3 Team will work on during development and balancing. 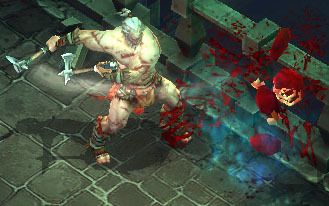 Critical hits in Diablo II were a major factor in the game, but only worked with physical damage. Critical strike was called "Deadly Strike" on weapons, where it occurred on quite a few unique items, set items, and runewords. (But not magical or rare.) A number of character skills boosted critical strike as well. All of the Barbarian's weapon masteries conveyed critical strike bonuses, as did the Amazon's Critical Strike, and the Assassin's Claw Mastery. In Diablo I critical hits are a hidden bonus for the Warrior and Barbarian characters. They gain a 1% chance to deal double damage with each Clvl they gain. At level 20 they deal double damage 20% of the time, at level 30 they do it 30% of the time, etc. ↑ "Bashiok on Critical Hits". http://blues.incgamers.com/Posts/1/1/4/10/7462/deadly-strikecritical-strike#postId_20442. Retrieved 2010-08-24. "We have Critical Strikes. When you crit it does 50% more damage. Your chance to crit and increase above the 50% are both variable with skills, items, etc." This page was last edited on 8 July 2014, at 11:11.